This question of Fixed Cost versus Time and Material pricing comes up on a regular basis, as I consult with clients around the country. So, let me offer a few points on each. Time & Material (T&M) pricing describes a process where we do not give our client an actual estimate before we do the work. Instead, when the work is completed, we send them an invoice that is calculated based on the amount of hours we worked plus any materials marked up at a specified rate. T&M pricing doesn’t require a lot of experience or time. Fixed Price Contract defines the services or scope of work to be provided very specifically and then sets a single price for that project. A Fixed Price Contract requires more work and experience to properly identify and quantify all costs that will be associated with the scope of work and then apply a gross profit mark up to reach our selling price. On the surface T&M looks like a no brainer. We can simply charge our client whatever it takes to cover our labor and materials and make a profit. Why would we do it any other way? We can’t lose right? So here is the bottom line. T&M sounds great and it makes sense in some types of work but there are some major drawbacks and disadvantages to T&M when it is used extensively in your business. 1. Invoicing Invoicing can be complicated. In order to be effective at creating accurate T&M invoices, you need to have the receipts for all materials, including inventory items, and you have to know exactly how many hours were utilized, including drive time. This requires a coordinated effort between the sales person, production and accounting. This can be a time consuming process and many times invoicing is delayed waiting for all the pieces to come together. In some cases, the absence of an actual contract can lead to jobs that never get invoiced. With a fixed price estimate, once a job is sold, it can be routed to accounting as an open job. When the work is completed, an invoice can be produced and sent to the client. In maintenance, the difference between T&M and Fixed Cost is dramatic. Fixed Cost installment pricing can be batched up and invoiced at the beginning of the month, while T&M cannot be completed until all costs have been tabulated at the end of the month. This can be an administrative nightmare and can create a cash flow crunch. A general principle we ascribe to at Envisor is that the less time that is spent on the sales/estimating process, the more time the rest of the organization spends in process, production, invoicing and collections. All mark ups should tie back to your company overhead recovery plan and labor and material mark ups need to equate back to a gross profit metric. An additional drawback to T&M is that you have no opportunity to increase profit over your preset rate. In other words, there is no advantage to hustling to get work done because the margin stays constant. In a fixed price estimating model, once we have identified our cost, we can divide by a gross profit target to arrive at our selling price. If we manage to beat our estimated hours or buy in our materials cheaper, we actually have an opportunity to increase our gross profit more than we estimated. 3. Budgeting and Forecasting Using a predominately T&M pricing model makes it very difficult to build an annual operating budget, which in turn makes it difficult to forecast and track sales and profitability against a benchmark. On the production side of the business, T&M makes it hard to quantify and forecast labor hours due to the fact that we have no backlog and no budgeted hours for the upcoming work. In the fixed price model, you can build a predictable backlog of revenue and man-hours in advance. In maintenance there is a great advantage to using fixed price contracts and installment billing. This allows us to be able to predict revenue and labor needs for the entire year once your contracts are renewed each spring, and we can plan accordingly. 4. 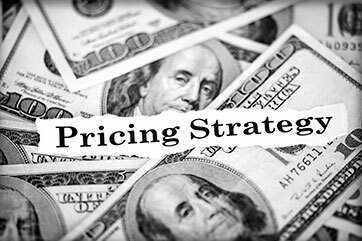 Upset Customers Maybe you are good at giving your client a clear expectation of how the final pricing will come out. Still, many times the final price in T&M is an unpleasant surprise to the client, and we wind up offering some illogical discount in order to appease them. With fixed price estimating, our clients should not be surprised when they receive their final invoice. So if you haven’t noticed, I am not a fan of using T&M on a large scale. T&M does have a place in certain types of service work where a clear scope cannot be identified in advance, such as irrigation repair work. Fixed price estimating does require extra work to identify the actual costs and breakeven on every job. But the benefits far outweigh the extra work and risks.